To learn about this winery out of Bel Air in Los Angeles, California, check out my review from Sunday for their 2015 White Wine. Their 2013 Red Wine is a Bordeaux-style blend made from primarily Cabernet Sauvignon and Merlot as a secondary, with splashes of Cabernet Franc and Petit Verdot. It saw eight to ten months in 100% new French oak and two years of bottle aging. Both of these Moraga's were tasted and reviews written on the same night, and both to the same album. 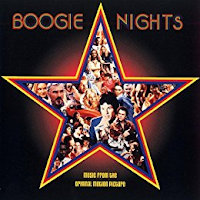 Today's music selection is the Boogie Nights soundtrack! I hear Mark Wahlberg hopes he's forgiven by his deity for making this movie. Pffffft. Dude, cut the crap, it's the best thing you've ever done and you know it. Embrace that. Man, these songs bring me back. Who would have thought that a disco album would be one of the most essential albums to the high schoolers of the late 90's? It's not only a legendary soundtrack, but it's an amazing album. 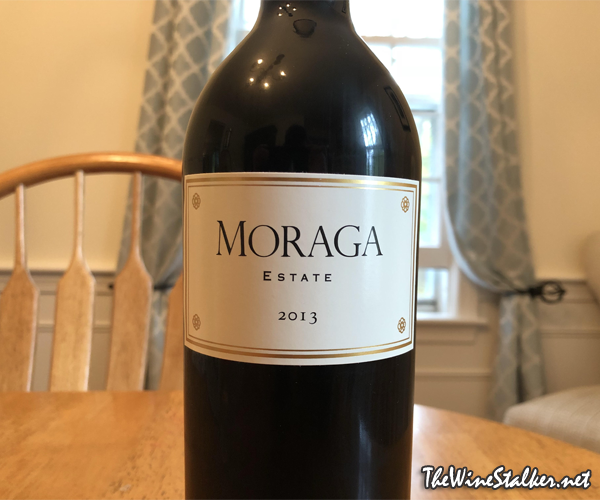 I did a lot of smiling and dancing while reviewing Moraga. Here is what Scott Rich, Moraga's winemaker, had to say about 2013: The 2013 growing season was the second year of serious drought at Moraga, with less that 4" of rain for the entire season. The positive side of this phenomenon was warm, dry weather during flowering and fruit set i June which set the stage for a reasonable crop load. Even though temperatures never reached triple digits (the high for the year, 96˚ F, occured in mid-August), overall, the year was slightly warmer than average. The grapes responded by producing a modicum more high-quality tannins than we often see. The first half of Spetember 204, when the first fruit had acheived perfect ripeness. We picked sporadically over the next two weeks as each section of the vineyard hit optimal tannin and flavor development. The last day of harvest was October 7, two to three weeks earlier than the norm. During the winemaking process, each lot went through pre-fermentation maceration and fermentation seperately. Then they were sealed in their air-tight fermenters to go through more maceration. After being drained and further pressed, each lot was racked into 100% French oak for almost two years. Once they decided what exactly the blend would be for the vintage, the wines were unracked and blending began. The wine is garnet in color. And oh the mocha. Thhaaaaa mochaaaaaa. And the vanilla, too. This nose is KILLING IT with those coffee beans, cocoa beans, and vanilla beans, man. I freakin' love it! There's also cassis and black cherries playing the fruit role, with cedar and charcoal and mint as a supporting cast. It's medium to full bodied with a dusty mouthfeel and hot tannin. There's flavors of black cherries, juicy plums, burnt caramel, and ancho chiles. It finishes hot and dry with flavors of plums, pencil shavings, and ancho chiles. Alright, guys. This is $175. That's a lot of dough. Is it worth it? Does it stack up to its competition in its price range? Yes and yes. It's even better than just a recommendation. But I still can't just go ahead and give it a 5 out of 5 in price vs quality because, I mean, it better make me want to drop $175 right now on a bottle even though I can't afford it, and it doesn't quite do that for me. But it's pretty outstanding, and better than other Cabs or Cab-based blends that I've had in the same ball park for asking price.